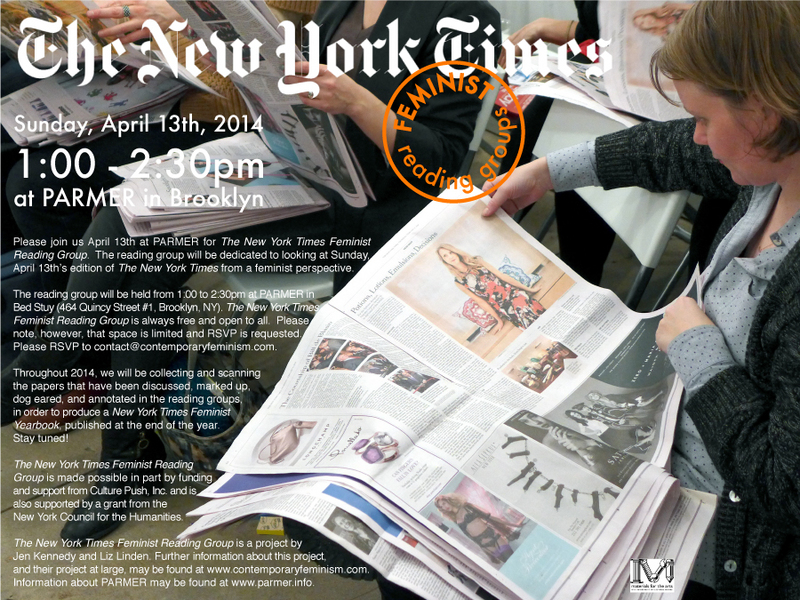 The New York Times Femiinst Reading Group is a project by Jen Kennedy and Lis Linden comprised of periodic reading groups, free and open to all, dedicated to examining that day's issue of the newspaper. Reading groups have been held all over New York City and beyond, including at DISPATCH, P•P•O•W Gallery, the New Museum, and Murray Guy. Throughout 2014, The New York Times Feminist Reading Group will also be used to generate a community archive of annotated newspapers, The New York Times Feminist Yearbook, which will be available in print and online soon. This year The New York Times Feminist Reading Group is made possible in part by funding and support from Culture Push, Inc. and is also supported by a grant from the New York Council for the Humanities. For an upcoming schedule of reading groups and more information on the project please visit their contemporary feminism website.